Blackburn make unwanted history, Newcastle win title – Royal Times of Nigeria. 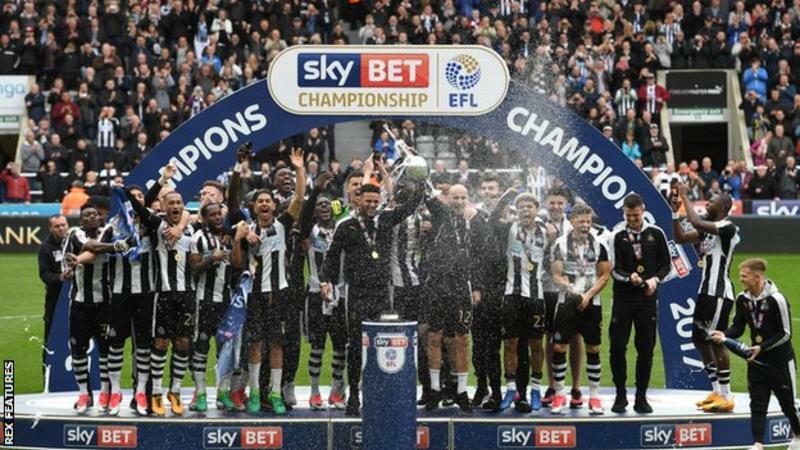 Under manager Benitez, Newcastle brought 12 players to the club after dropping into the Championship last summer, with Matt Ritchie and Gayle moving down a division to sign five-year deals. Blackburn Rovers became the first Premier League champions to drop into the third tier of English football on Sunday whilst Newcastle claimed the Championship title on a nerve-racking final day of the regular season. Wins for another historic club, two-time European champions Nottingham Forest — 3-0 over Ipswich — and Chinese-owned Birmingham City, who beat Bristol City 1-0, condemned Rovers, owned by Indian poultry firm Venkys, to the drop. Rafael Benitez-managed Newcastle did what they had to do beating Barnsley 3-0 but it took a howler from Brighton goalkeeper David Stockdale to ensure they returned to the top flight as champions. Brighton — who started the day a point ahead of Newcastle — looked to be heading to a 1-0 win over Aston Villa until Stockdale somehow failed to prevent Jack Grealish’s long range effort going into the net and the Seagulls were held 1-1. Blackburn at least departed with a 3-1 win over Brentford but that was little consolation as they contemplate League One and third tier football for the first time since 1980. “We gave it everything we had today. It is a really disappointed day because we gave it absolutely everything,” Rovers midfielder Jason Lowe told Sky Sports. Things had looked extremely rosy for Rovers early on as they stormed into a 2-0 lead — Scottish international midfielder Charlie Mulgrew’s goal, a delightful freekick, the pick of the two. However, by the time Craig Conway converted a late penalty to make it 3-1 the game was up as Forest and Birmingham were winning. Forest’s hero was Congolese striker Britt Assombalonga who set them on their way with a first-half penalty — shortly after a superb save by their ‘keeper Jordan Smith had kept the scores level — and added his second and the hosts’ third with an excellent solo effort in the second-half. That had Forest manager Mark Warburton, who took the job after an acrimonious departure from Scottish giants Rangers earlier this season, charging down the touchline fist pumping in celebration. Birmingham, whose wounds were largely self-inflicted with a disastrous run under Gianfranco Zola after the owners removed Gary Rowett despite being just outside the play-offs, scraped the win they needed at the very least. A first-half goal by Che Adams — in front of Bristol City’s biggest crowd for 37 years of more than 25,000 — raised a smile from veteran caretaker manager Harry Redknapp and sighs of relief from the fans.